The G.R.E.A.T. Games have entertained youth in Nye County for the past 19 years. G.R.E.A.T. stands for Gang Resistance Education and Training. During the summer months two Nye County deputies go out and take their anti-gang message on the road, educating and entertaining hundreds of kids who have fun and learn alternatives to gangs, drugs and violence. 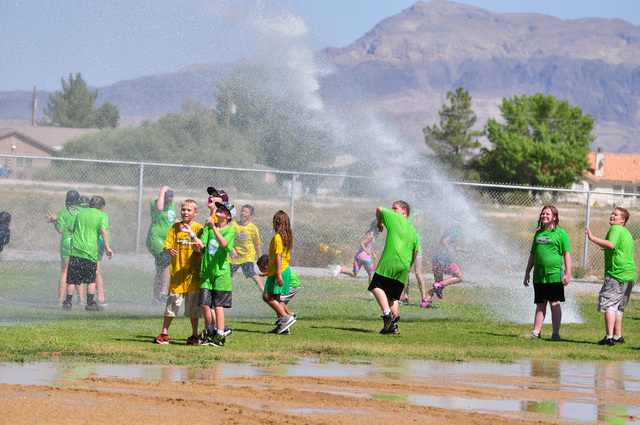 The games are organized by the Nye County Sheriff’s Office and along with the games, the kids build leadership and social skills and win prizes. There is no cost to register. The deputies rely on teen and college-age students to drive the program. Lunches will be provided. Please bring sunscreen and a water bottle for your children. The NCSO is also looking for parents and high school students who would like to volunteer. If you are interested in being a volunteer, please complete an application and submit to the sheriff’s office at sheriff@co.nye.nv.us. For any questions please contact NCSO deputies Fernandes and Ferrel at 775-751-7000. Gabbs: Gabbs School, games June 6 – 9, 8:30 a.m. – 1:30 p.m. Round Mountain: softball fields, games June 20 – 23, 8:30 a.m. – 1:30 p.m.
Tonopah: Logan Field, games June 27 – 30, 8:30 a.m. – 1:30 p.m.
Amargosa: Amargosa Park, games July 5 – 8, 8:30 a.m. – 1:30 p.m.
Beatty: Cottonwood Park, games July 11 – 14, 8:30 a.m. – 1:30 p.m.
Pahrump: Petrack Park, games July 18 – 21, 8:30 a.m. – 1:30 p.m.